The tuff hills from the old age have contributed to the construction of underground tombs. The catacombs began to develop from the second up to the tenth century ( from the second century are dated the oldest paintings known). Christianity spread from the first century, and this development is attested by the privileges given by the Emperor Constantine, an example is the construction of the Baptistery of San Giovanni in Fonte. Maximum expression of early Christian culture are: the Catacombs of St.Gennaro- St.Gaudioso -S.Eufebio. Named after the bishop of Benevento martyr in Pozzuoli in 305. The relics were taken to Naples into the catacombs in the fifth century. People have access to the Catacomb from the church of Good Counsel. 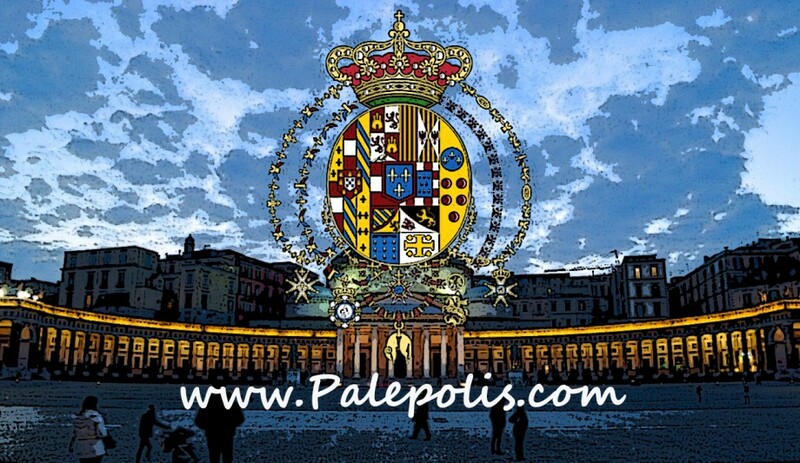 The original center was an underground buring place of a noble Christian family in the second century. There were numerous expansion works, which were completed in the fourth century, having reached a second level of galleries. In the fifth century the faithful people wanted to be buried next to the saint, and it was necessary a further expansion with the opening of new cubicles. The ancient tomb consists of a trapezoidal room with a central baptismal source, commissioned by Paul II. In 776 a repainting of the room with the fresco of Christ’s baptism took place. To the south we find the basilica of Agrippino dating from the fifth century, worth considering are paintings depicting the saint who heals the Moro, works dating back to the mid-ninth century. Behind the vestibule are the tombs. 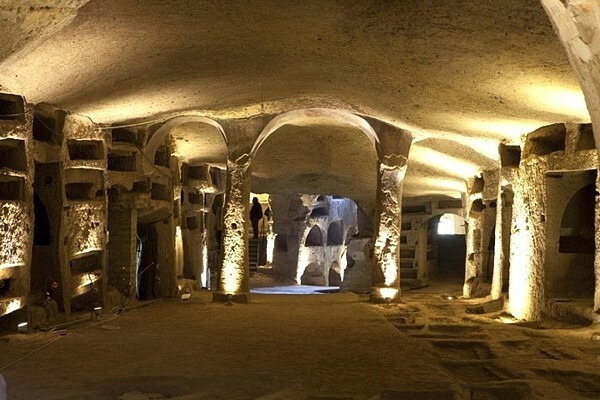 The upper catacomb dating from the third century, is formed by two almost square rooms communicating with each other by a staircase. Poorly preserved is the scene of two women building a tower, taken from a Greek work “the pastor of herms”. In the catacomb centre there is the Crypt Of Bishops. Decorated with mosaics depicting bishops of the fifth century, remarkable is the one of bishop of Carthage, a circular field of golden tiles surrounding the African bishop recognized by different colors of the cards, holding the book of Gospels. In this same crypt, all the bishops of the fifth century were buried, but the absence of registration does not allow their identification. It is located at the Church of St. Mary of Health. It owes its name to an African bishop who died in exile in Naples in 452. It can be reached through a passage to the catacombs beneath the altar. It leads to a double row of cubicles, found again in 1616, after the Dominicans had obstructed the passage with twelve altars. The St.Gaudioso tomb is recognizable by the mosaic epithaf in which the saint is exactly depicted. They are named after the eighth bishop of Naples. The catacombs were digged again in 1931, of the two frescoes found, one is dating back to the fifth century (a prayer with a red tunic between two saints), the second painting represents a dead woman between the archangels Michael and Gabriel.